The bank is filling out. There is an issue with weeds unfortunately; and because it is so steep when I tense myself not to fall while I’ll pulling out weeds I damage my back. There have been some moments in the last week when I was bent almost double like a very, very old woman! Some Gaura are looking a little wilted; it has been a very hot month with very little rain. As I write it is raining very gently just perfect for soaking slowly into the soil. When it rains hard the water just runs off the slope and very little is absorbed. Finally the Panicums showed signs of new growth so I have been able to lift, divide and replant them. 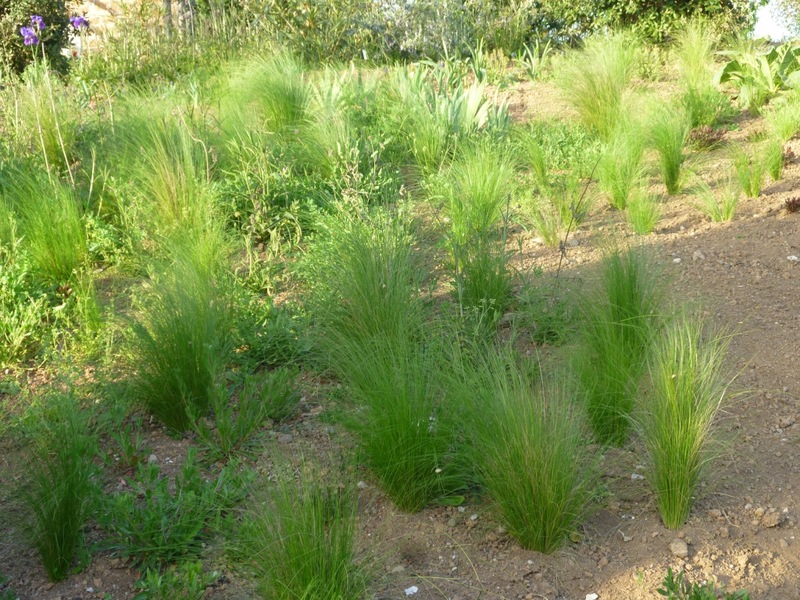 Some have found homes in other beds too, where I needed grasses that didn’t require water. 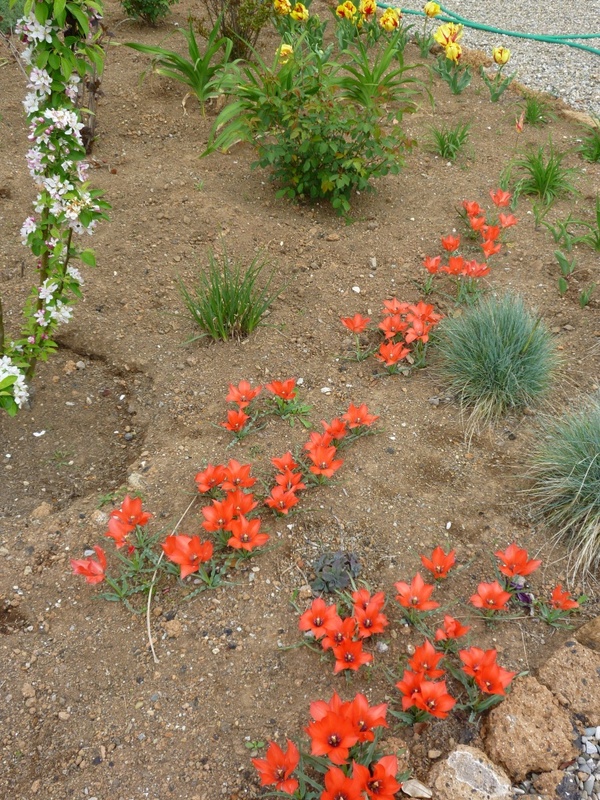 I have spaced them differently too so that I will add some other perennials between them to add to the prairie effect. 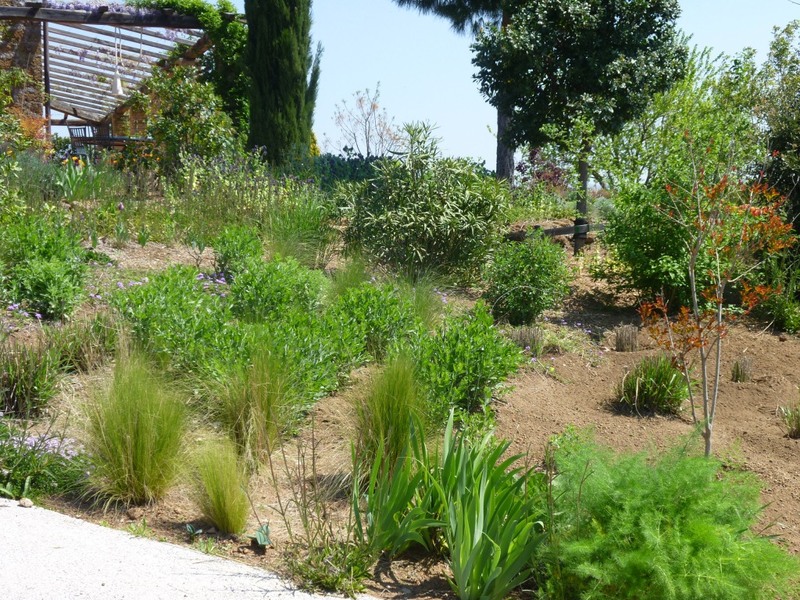 There are lots more Gaura self-seeded in the rose bed and also into the gravel paths so I will move some of these. 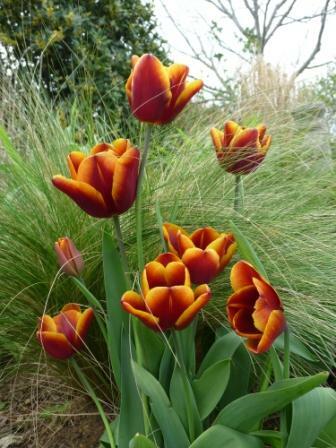 I would also like to add tulips here in the autumn although the thought of planting them is rather daunting. 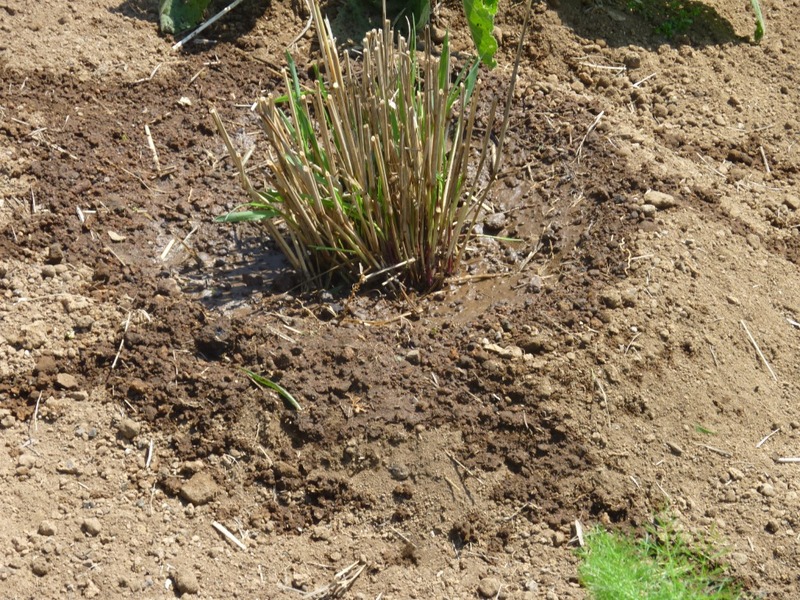 I hope you can see my method of planting; creating a depression around the plant to hold water while it establishes – this is the method I use for all my plants; trees and shrubs have a large depression(we call it a vase here) around them that might remain for up to one year. It allows me to give a lot of water at one time, then nothing for a while to encourage the roots to search deeper for water. 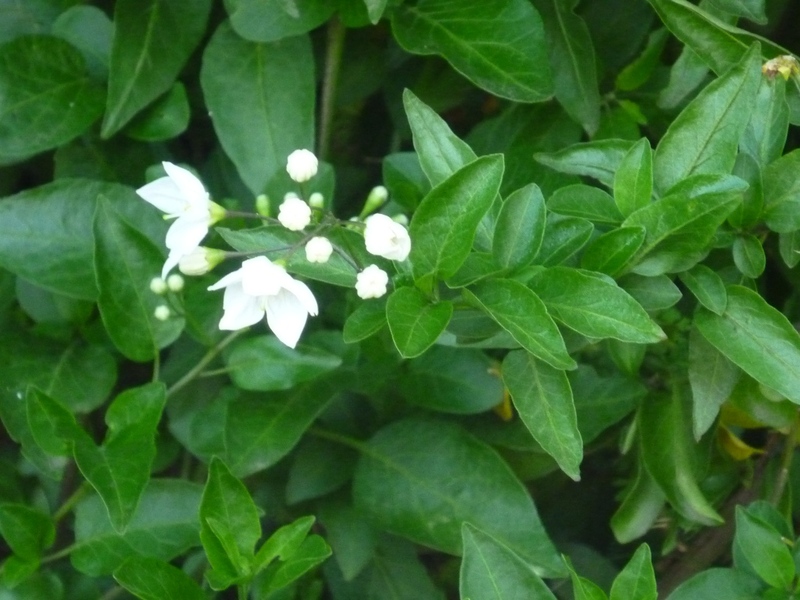 To one side where there is a Solarnum jasminoides I have planted some rooted cuttings I took last autumn. 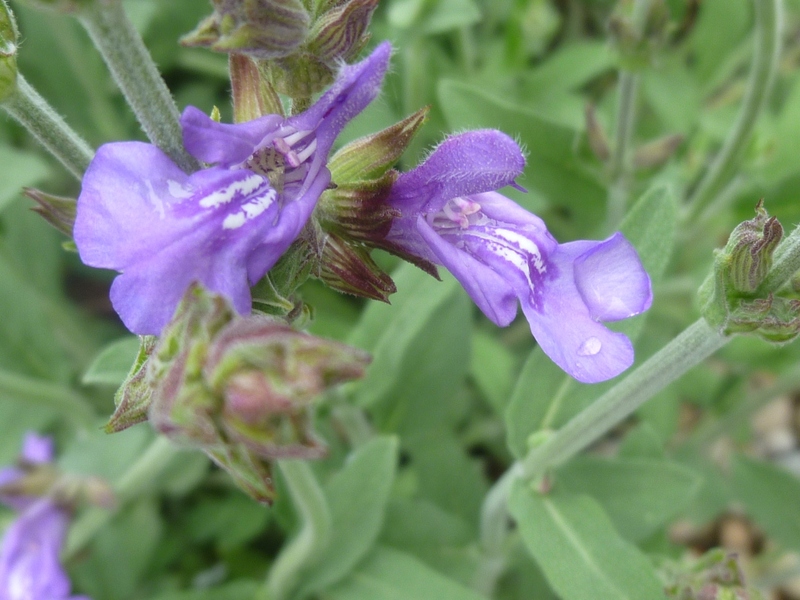 I underrate this plant (it was the only flowering plant in the garden when we bought the property), it has just begun to flower this year and last year it was continuously in flower until December. I am hoping for a frothy white mass tumbling down the bank. This week the alliums my friend planted for me last autumn have opened their buds and are making a striking contrast with Californian poppies that I scattered the seeds of when planting everything else. A big thank you to Helen, the Patient Gardener, for hosting the end of month review. 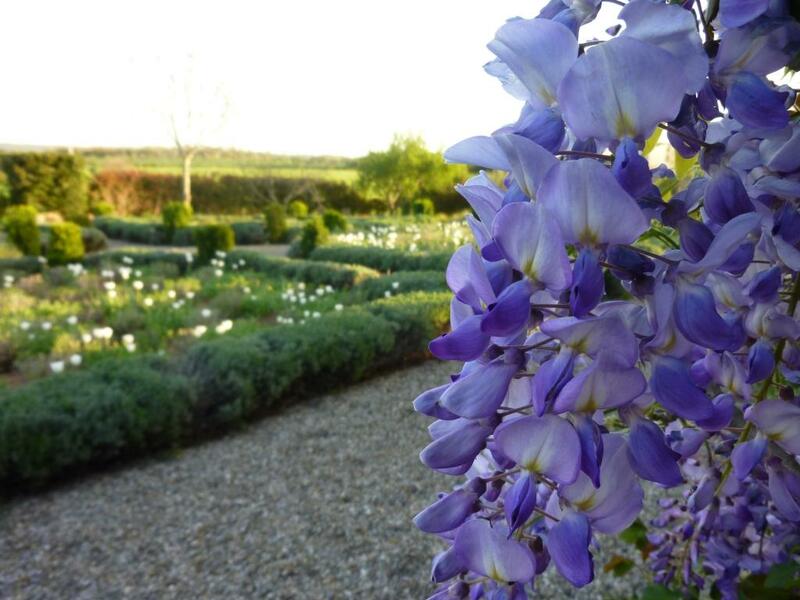 Visit her to see what’s happening in other gardens. 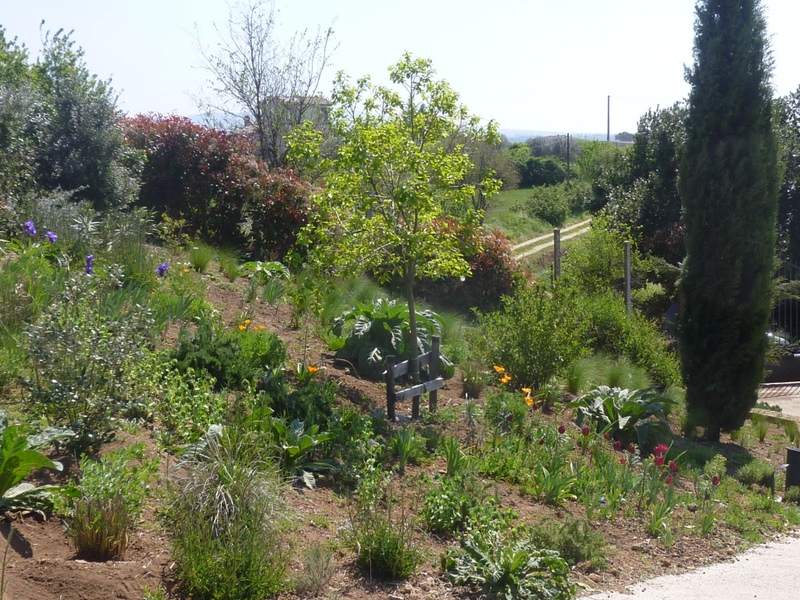 Reviewing the garden, or at least part of it every month really helps to focus the mind about what is working and what needs to be done. On Sunday I went to visit the local specialist in peonies. There are fields and fields of peonies that they not only sell as plants but in a range of cosmetics. As it looks as if something has eaten the buds on mine I’ll share these with you instead. Click on the photo below to see a vast array. 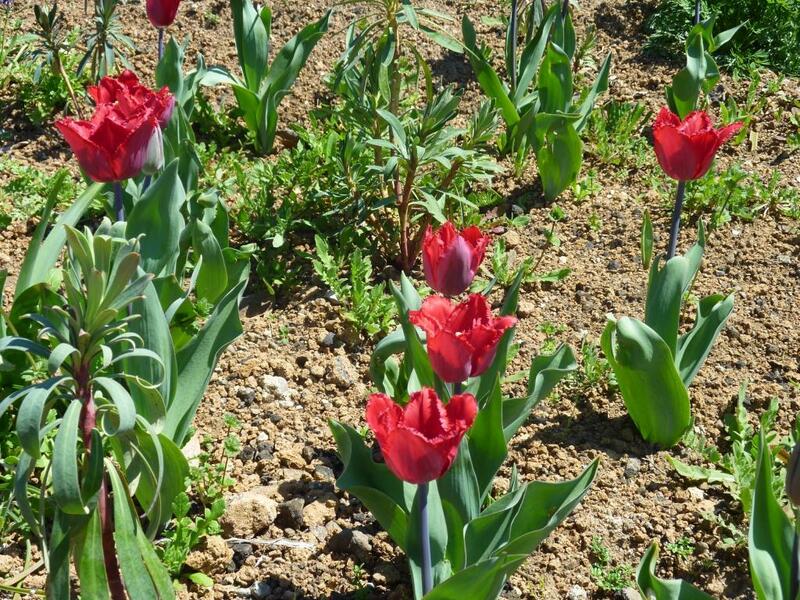 I promised in my last posts about tulips that I would tell you how long the various tulips flowered this year and which have flowered again from previous years. Looking back at my photos for last year I can see that although this has been as amazingly warm and sunny spring, the fact that the winter was cold (even if also with many days of sun) some of the tulips were at least 2 weeks behind this this. The roses are also later – but most are just beginning now. 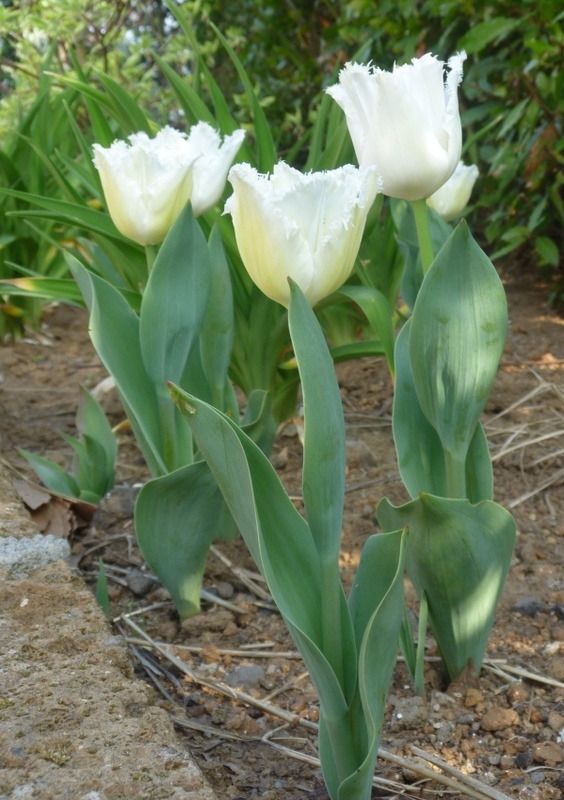 Because I don’t irrigate I am able to leave my tulips in the ground. 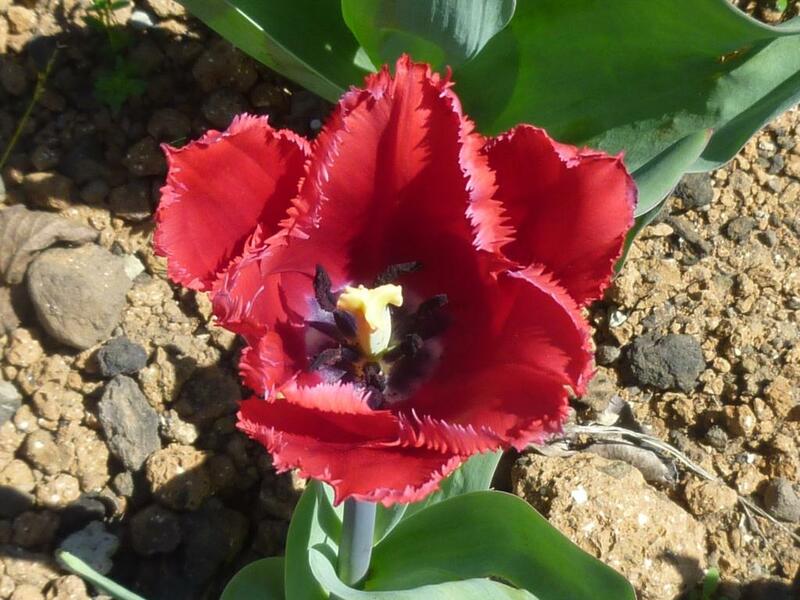 I only began planting tulips in the ground in autumn 2008 so I am only talking about tulips that have flowered for their third year at most. 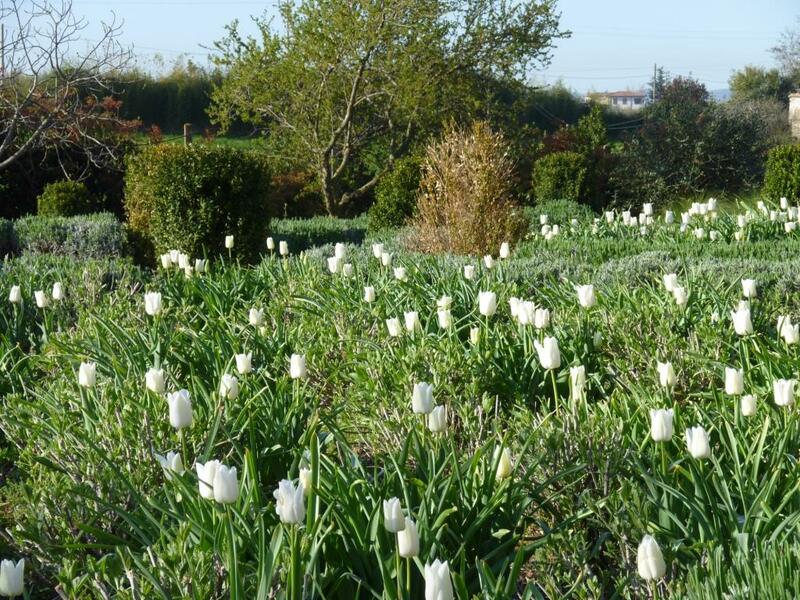 I planted 1000 Tulip White Dream in 2 formal beds in autumn 2008. 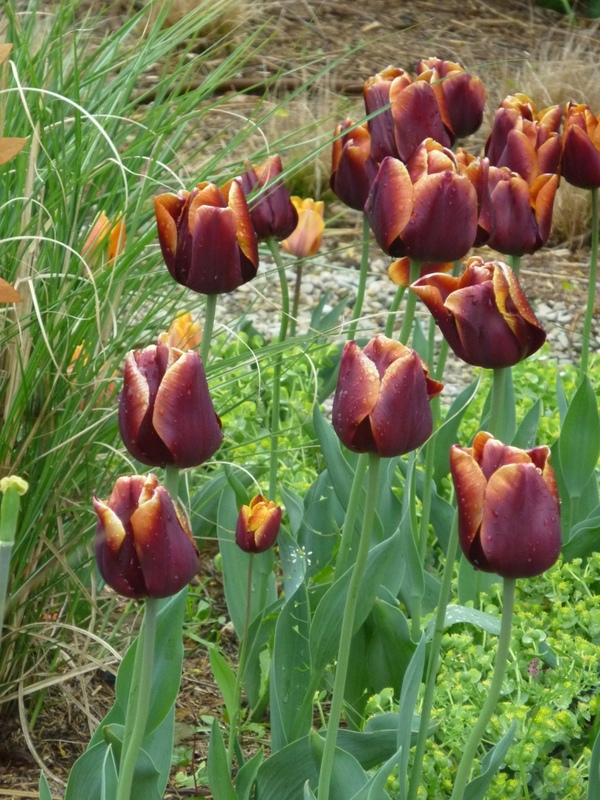 I planted by digging largish planting holes and putting 10 12 bulbs in each hole, I also planted alliums at the same time and at a slightly higher level than the tulips. 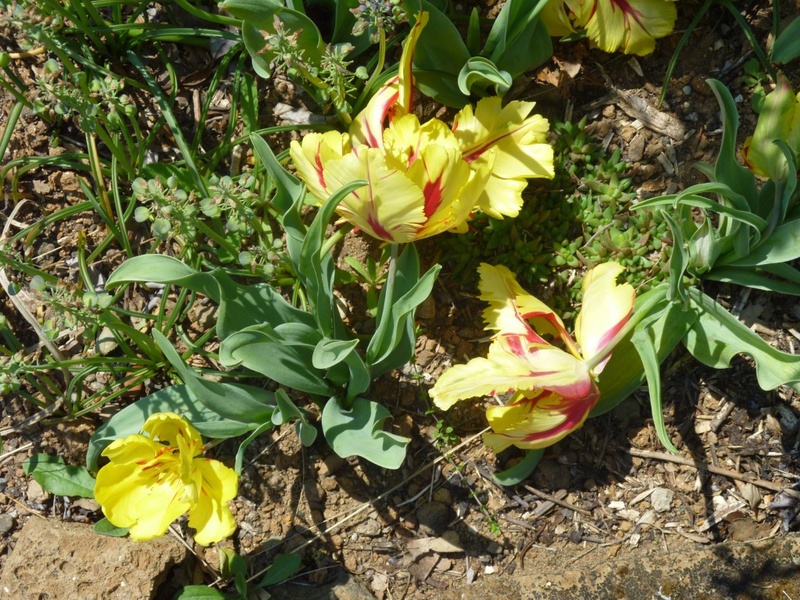 Even in spring 2009 I don’t think 1000 bulbs came up – I think this was my fault for planting too close together. They were also quite short in their first year, possibly because the site is so windy. 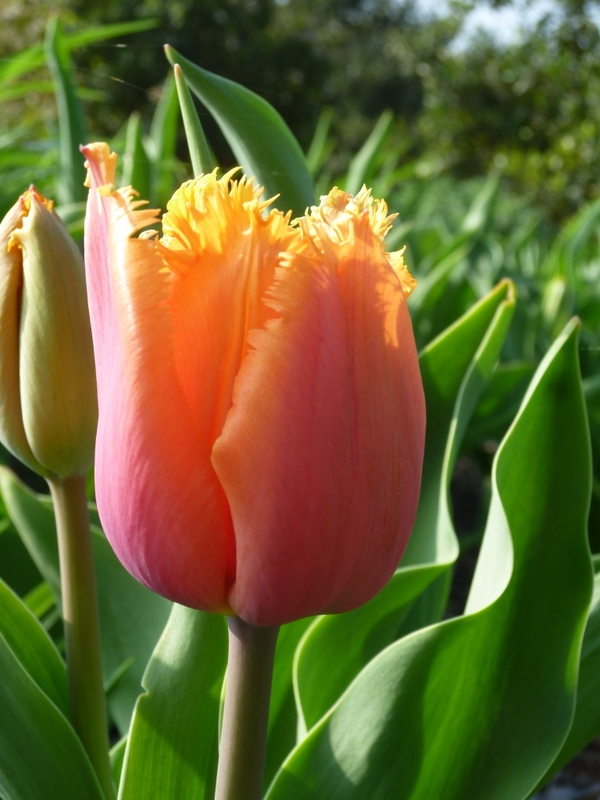 I have noticed this year that tulips planted in positions more sheltered from the wind grow taller! There have been less appearing each year but they have still given a good show. Triumph tulips flower early here and I intend planting another white tulip possibly Swan Wings into these 2 beds and the other 2 which haven’t had tulips before. 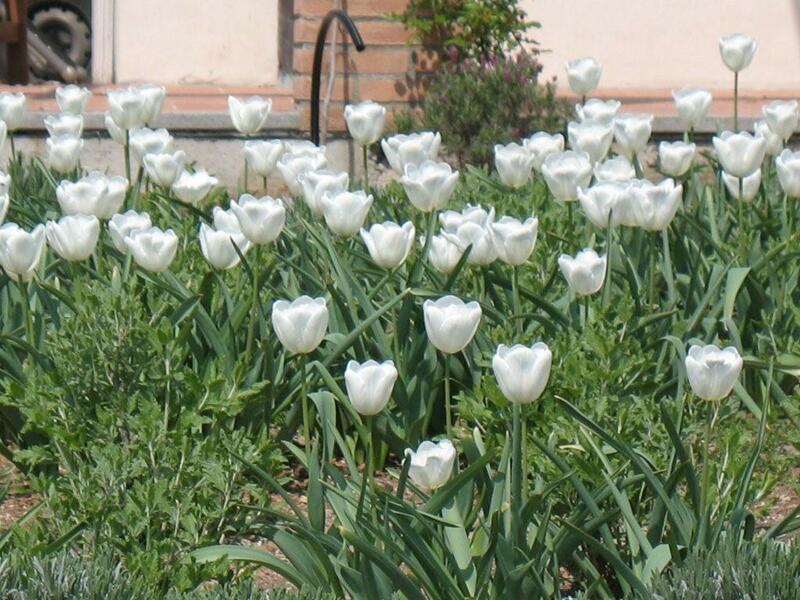 This number of tulips is quite expensive but I like to have something in these beds that will flower relatively early. 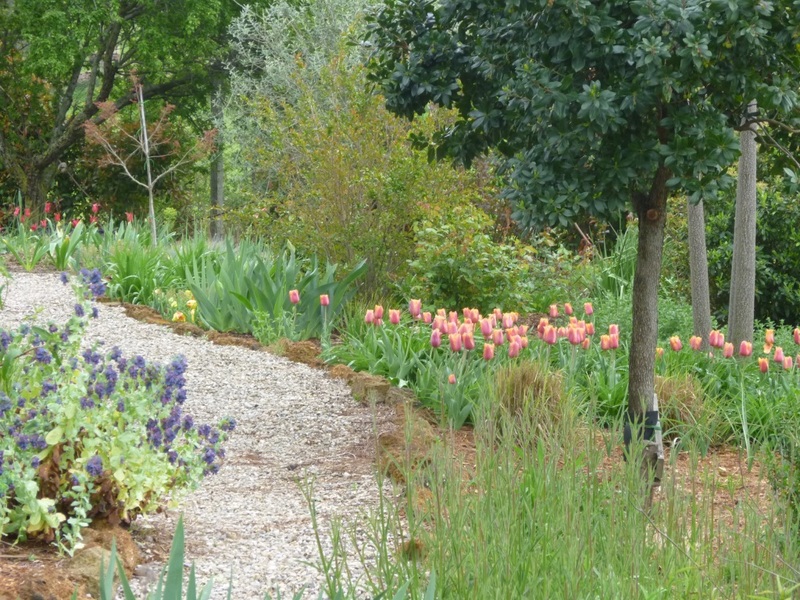 I am considering also planting the local blue Iris that grows wild everywhere in these beds with the perovskia. Negrita is another favourite; I love the strong colour and its large size. 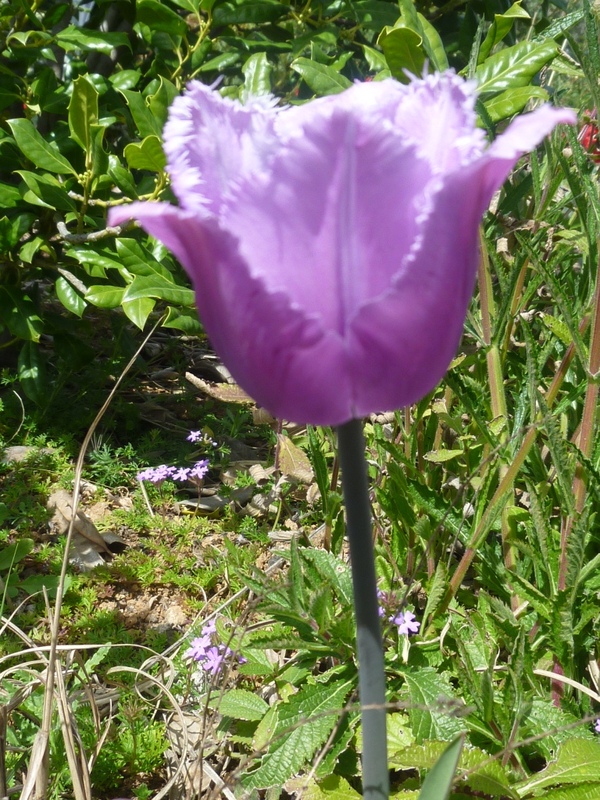 This is another Triumph type and is one of the first to flower and usually lasts well, often losing its petals long after others that opened later. 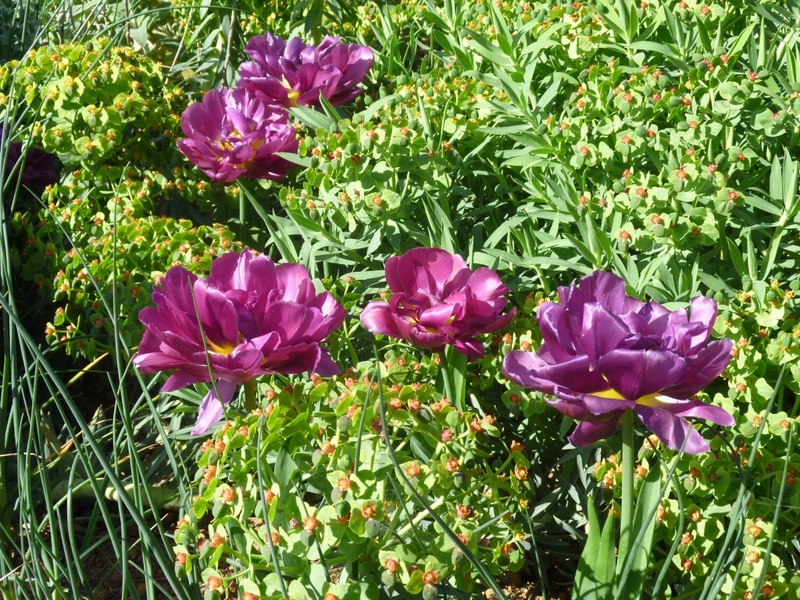 It is also very similar in colour to Double Dazzle which was also very long lasting I intend planting more Double Dazzle close to where the Negrita are planted to keep the colour tones but increase the period of interest. 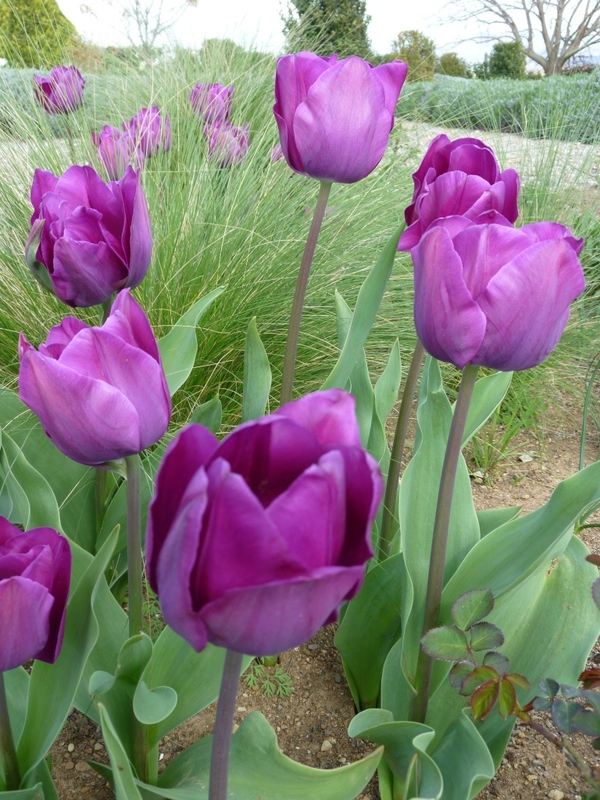 Even as they died the colour in the petals remained again increasing the period of interest. 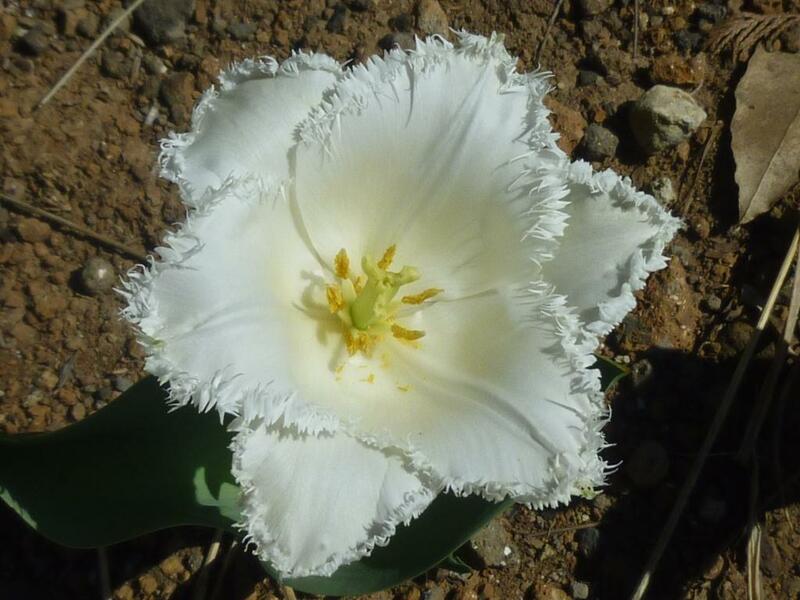 Another Triumph type tulip I enjoy very much is Abu Hussan; I particularly like the fact that it is perfumed, smelling delicately of honey. I first planted these in 2008, some in a pot that didn’t re-flower this year and a few in the ground some of which did appear again but probably only 25%. I planted a lot more in autumn 2010 in the small island bed close to two different varieties of Euphorbia. They have a real presence in the garden so I may plant more next autumn or wait another year or so to replenish those that fail to regrow. 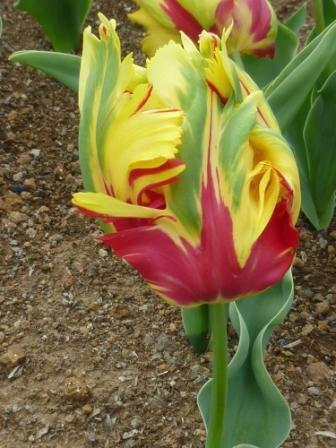 In 2009 I planted parrot tulips for the first time – I don’t really like as tulips but if I just think of them as a different strange flower then I think they are fun. I planted Texas Flame, the flower-heads were large and top heavy. I didn’t have any real hope that they would re-flower, I thought them too hybridised; however not only did the majority of them flower again this year, each bulb produced three flower heads! Maybe not quite so large as last year but still larger than their stems. Tiny Tulipa Linifolia begins with strangely twisted stars of foliage, last year I thought they were Alliums rather than tulips; they flower as if the flower is coming straight out of the ground, completely hiding the foliage. The colour is truly scarlet red and they appear to me to be smiling faces in the sun. 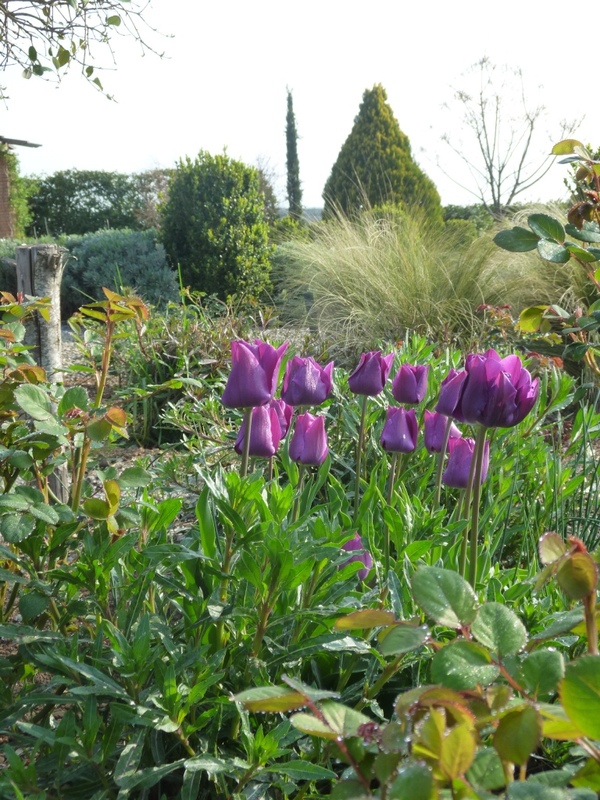 All last years bulbs re-flowered and some divided to give an even better show this year. Burgundy lace also flowered well for a second year. 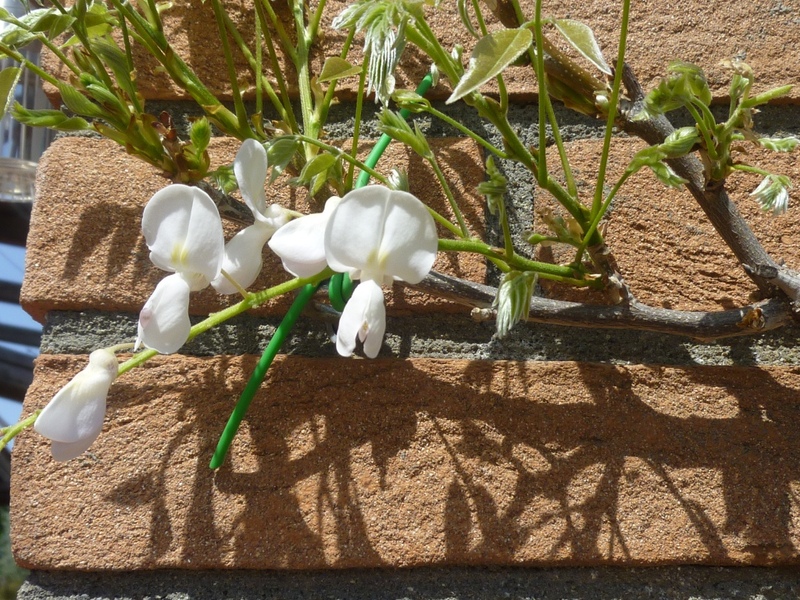 In 2010 they faded so slowly they seemed to be flowering for ever, this year despite hot sunshine and strong winds they have again outlasted many others. 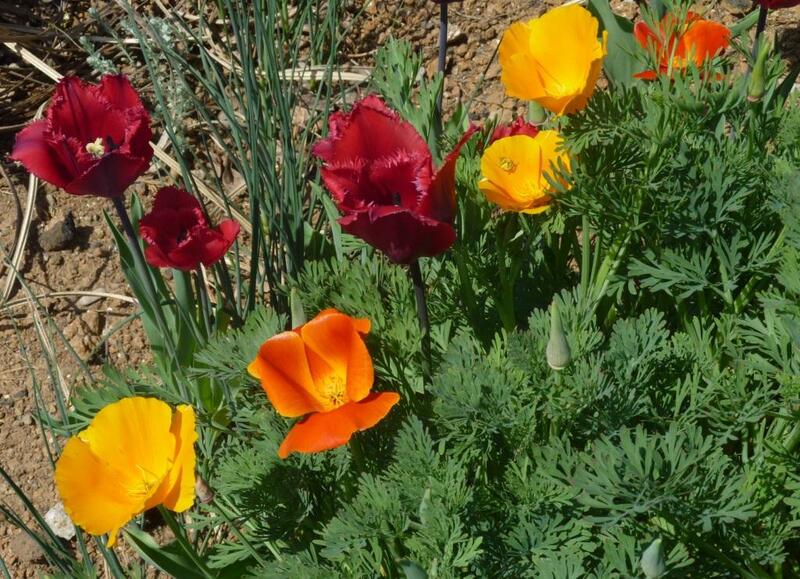 I didn’t remember accurately where they were planted and sowed some California poppies right where they were planted; the red of the tulips mixed with the orange and yellow of the poppies gave a surprising colour shock to the large island bed. Combined with purple (not sure of the name as they seem to be different to the description) and some Gavota planted nearby, the brightness reminded me of visits to Sissinghurst to see the spring walk (a part of that wonderful garden I always enjoyed almost more than the more famous White Garden or the wonderful roses). 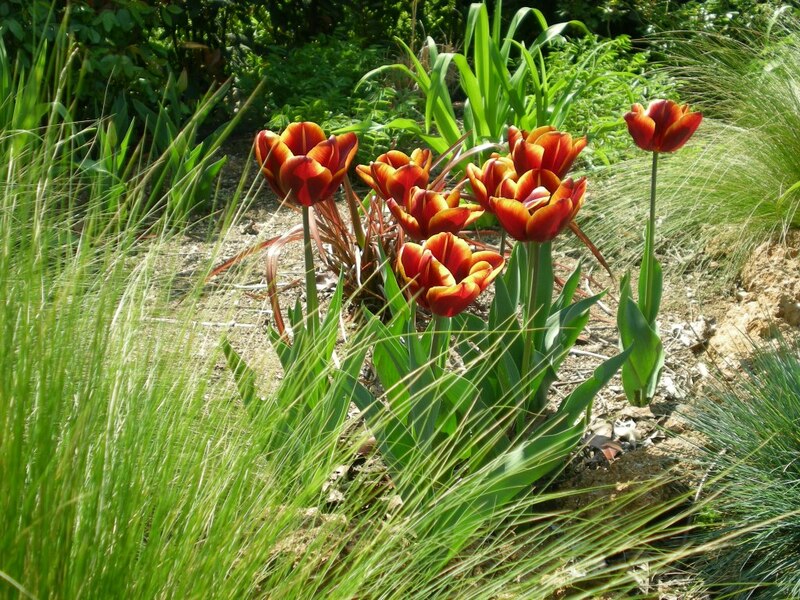 I think this and all the tulips look much better when planted with foliage of other plants close by. 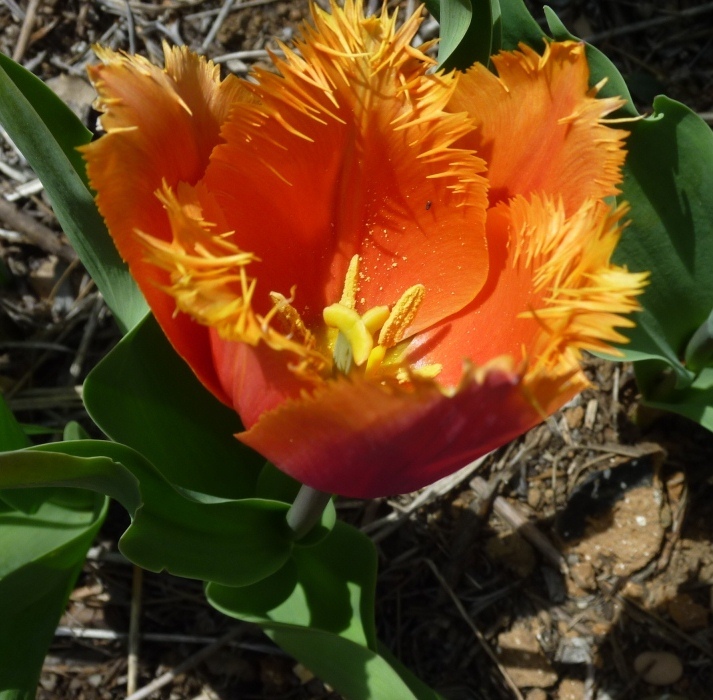 But I’ve written too much already, there is time for one more post about tulips and their complementary plants next week. I wish you all a very happy gardening Easter. After my post on Wednesday; I awoke on Thursday morning to gale force winds from the north east. Lots of flowers gave up the will to hang on and the garden was covered in petals. Only one wisteria still has blooms but that is over the table so if the weather warms up we will be able to enjoy it for a little longer. The crab apples, which had been covered with flowers, are now almost without flowers, and I’m keeping my fingers crossed that at some have set so that there are some apples in winter. But I am not depressed; there are lots of other blooms. Today is very grey and cold, still with a cold wind, although not so strong. The soft light has been good for the images. 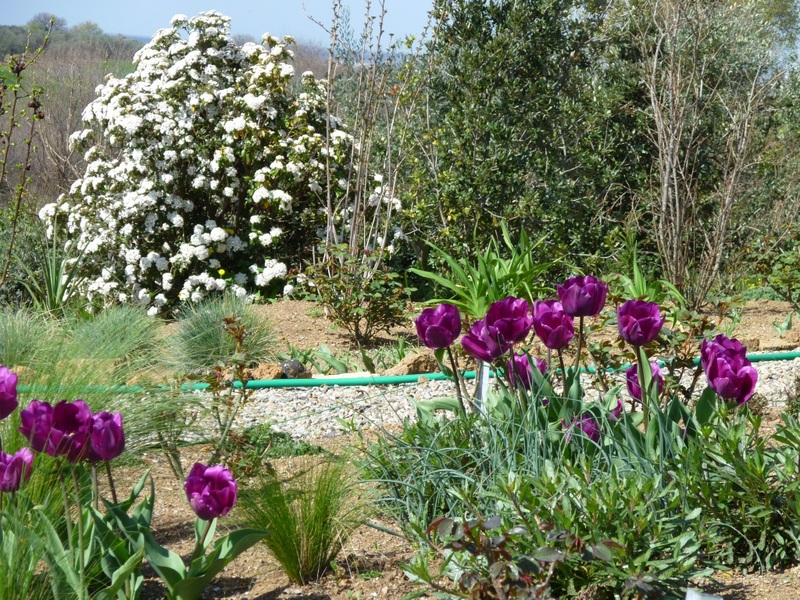 I am also happy that the garden is beginning to have a strong ‘presence’ so I have included some views as well as photos of individual flowers. 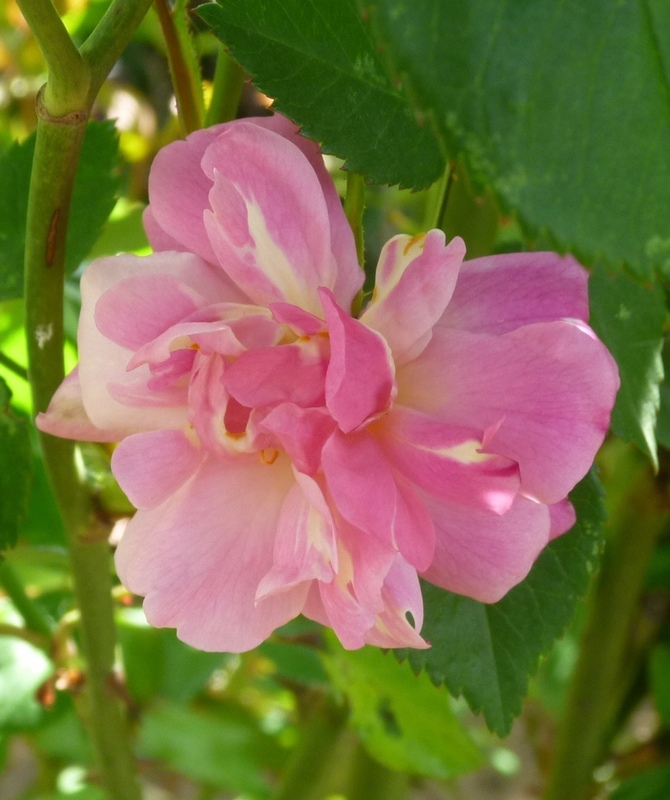 Rosa mutabilis is just beginning to flower and I am pleased that the tulips I chose to plant with them, assuming that they would flower at the same time, are the same tones of pink and yellow. It is so funny how one’s taste in colours for the garden change. 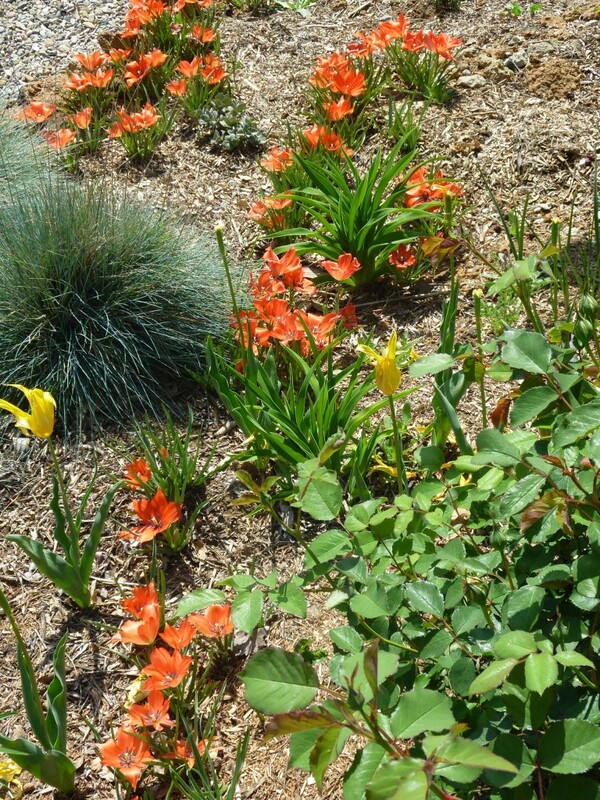 In the past the one colour I definitely didn’t like was orange; now I am enjoying many orange tulips as well as the Arbutilon and Hemerocallis in the back border. Actually the Arbutilon has been badly affected by the cold winter; there is new growth coming from ground level but I was hoping that it would begin to shoot from much higher up. Last year it was about 2 metres tall – it is fast growing but it won’t reach that kind of height in one season’s growth. Some plants have decided to flower TODAY, obviously they know about GBBD and wanted to be included! I found a sage, Rosa mulabilis and R. Clair Martin; plus buds about to open on the climbing rose on the pillars and the buds of Aquiligea are about to open. As there are so many images, I have, as in the past, put together a slide show. 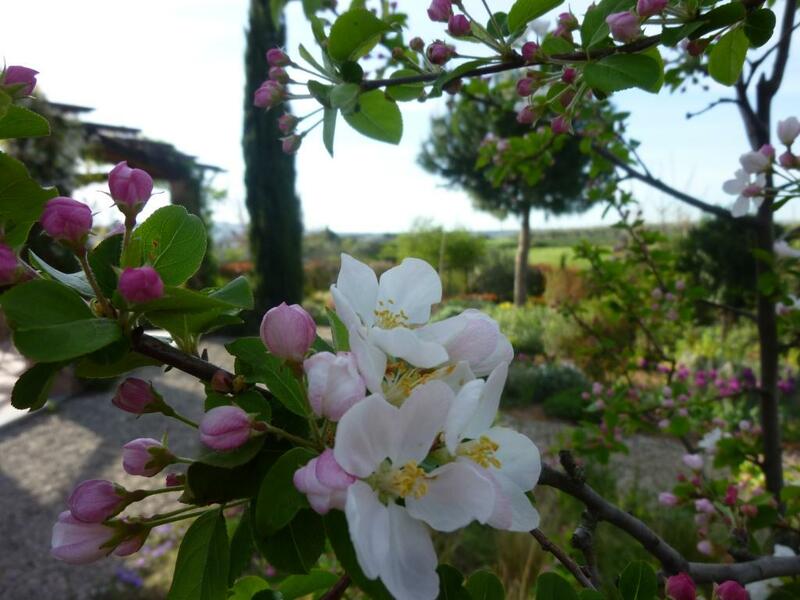 Please click on the image below to see everything flowering today in My Hesperides Garden. Thanks to Carol at May Dreams Garden for hosting GBBD again this month. 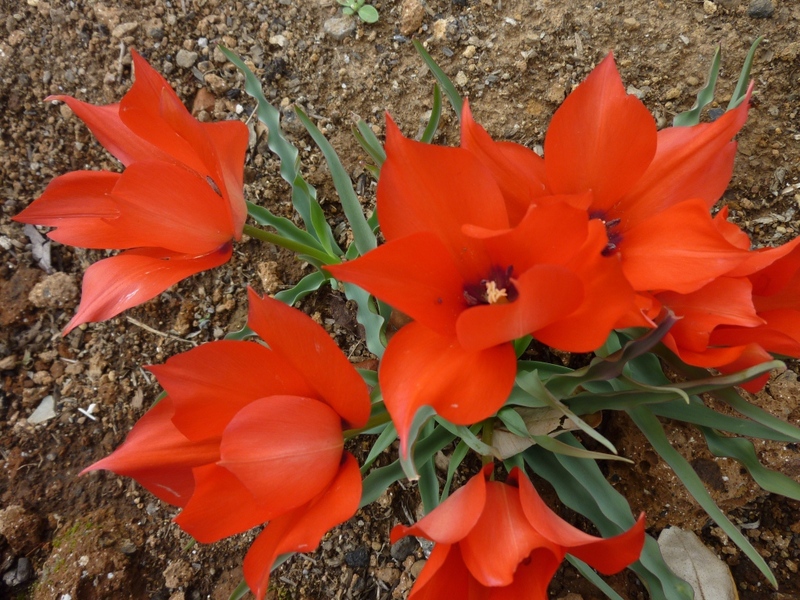 If you want to see what’s flowering all over the world today, pay her a visit. The weekend offered, again some glorious weather, although unseasonably hot. 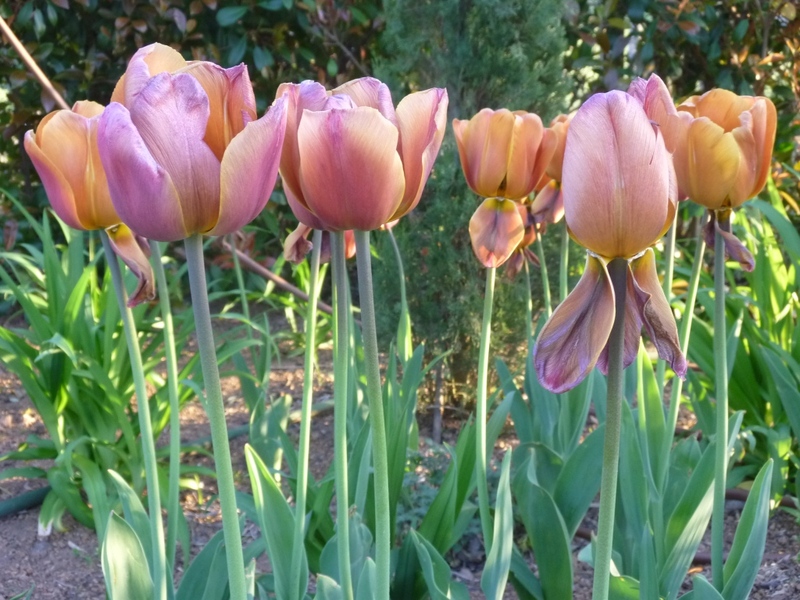 The tulips will not last very long this year; already T. Brown Sugar and Negrita are losing their petals. 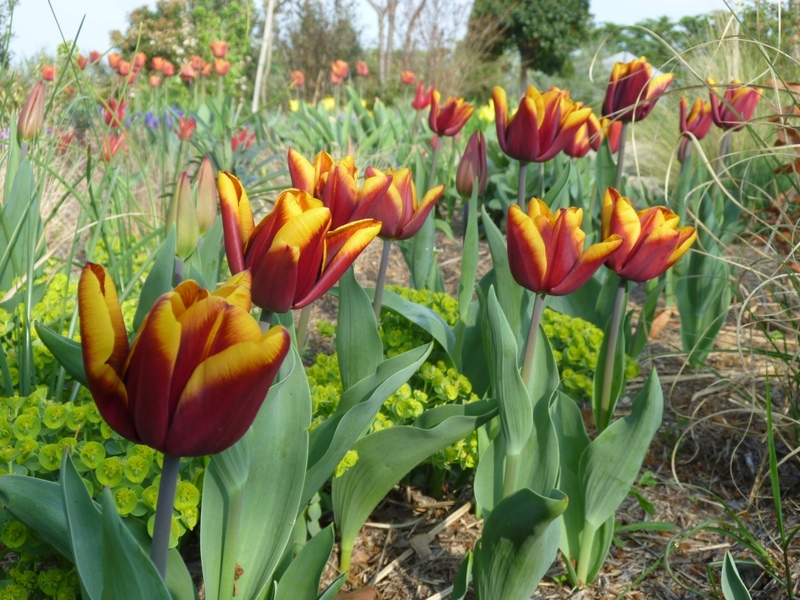 I wanted to share the joy the tulips give me so I invited lots of friends to come to visit the garden. Gardeners and not all enjoyed the show. 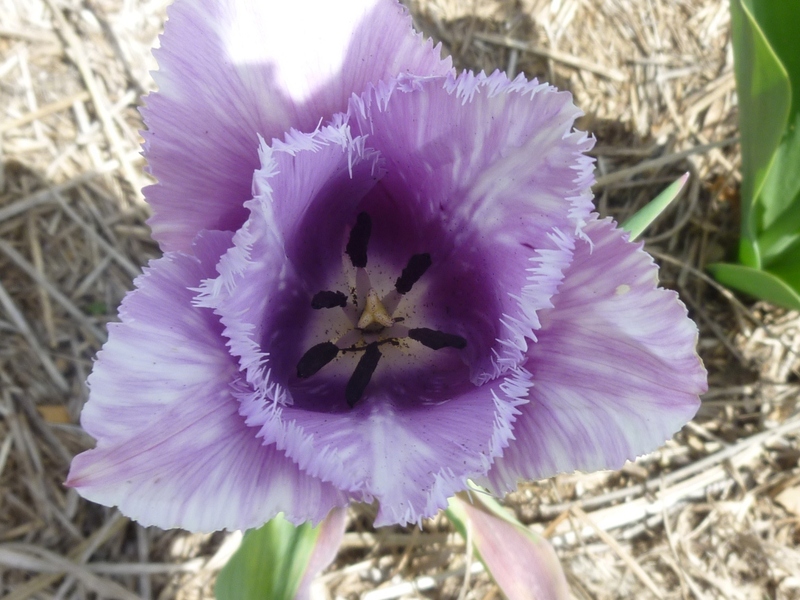 Fringed, Parrots, and even Lilly shaped are pretty much unknown so I was repeatedly asked if “this one” was also a tulip. Some were surprised that they didn’t need watering during the summer and others unbelieving when I said that watering in summer actually stops them flowering for a second year. 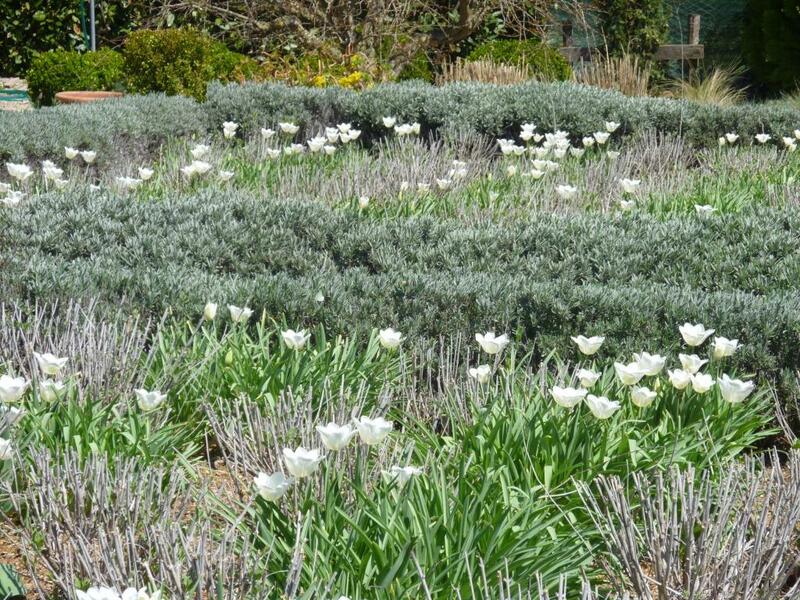 It is the third year for the white flowers in the formals beds and I think they actually look better this year than in the past, so I am back to toying with the idea of planting more in the other 2 beds this autumn. Maybe I could plant T. Swans Wings to add a little variation – Fringed varieties usually repeat well. Above: looking out accross the garden from the terrace. 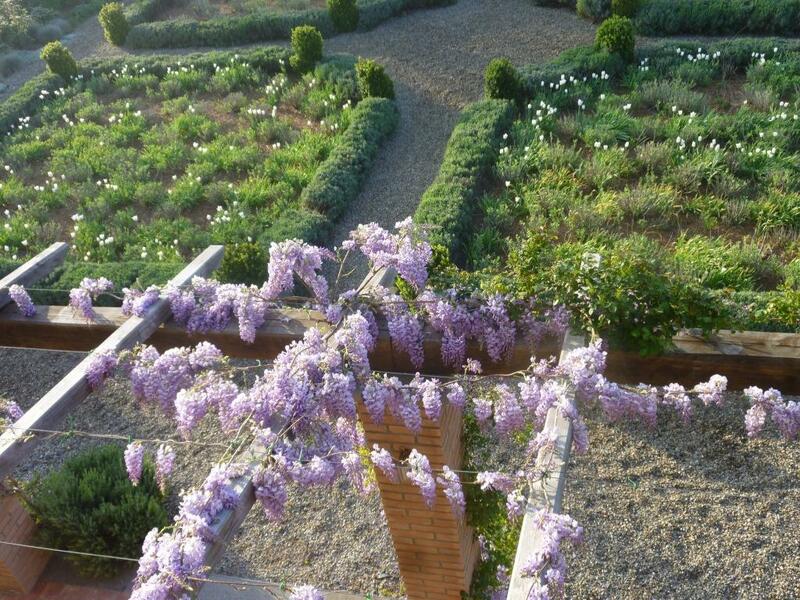 When we were looking for houses to buy we saw one that had an ancient wisteria on a pergola over the terrace; we were both so bowled over we nearly bought the house even though the house so terrible and probably needed to be pulled down. But it meant that when we found this house putting in a terrace and building a pergola were very high on the list of priorities. 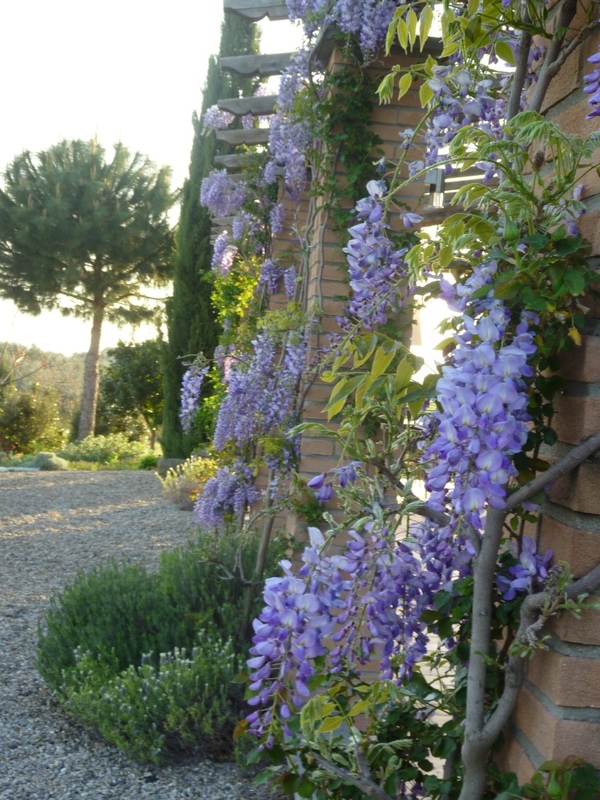 The pergola was finished in autumn 2008 and even before the builders had left I had planted wisteria on two sides of the house. 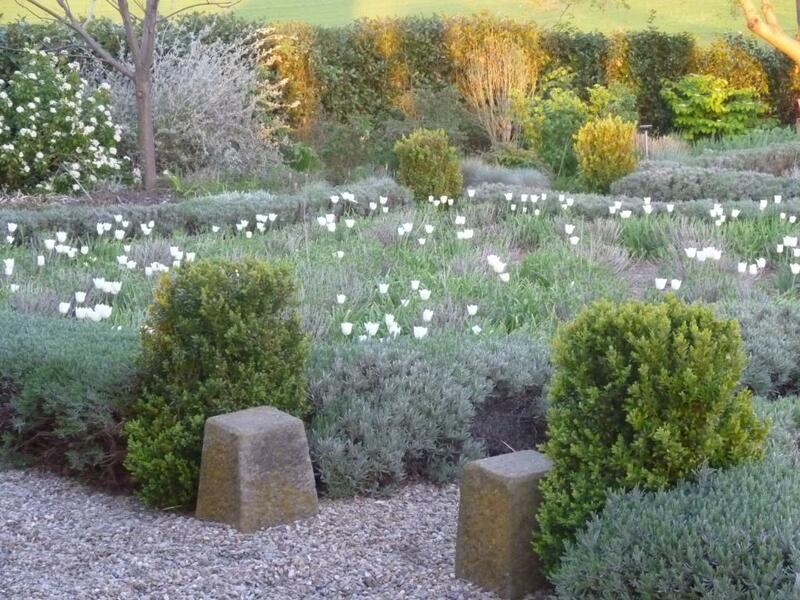 I have to admit that the four white ones have never done so well, being planted on the north east side of the house. This year they seemed full of bud, but yet again I am disappointed, the birds have pecked out almost every single bud, see more about this here. Walking along the terrace the perfume is so strong I think we would find it impossible to sit here for very long; but sadly this show will also be over all too quickly, leaving the delicious shade we also desire as the foliage fills out and later smaller, less intensely perfumed flowers, that are hidden amongst the leaves. The garden is looking full of growth and probably more colourful than I’ve ever seen, I must admit that my breath is taken away sometimes when I turn a corner or catch sight of something from a different angle. 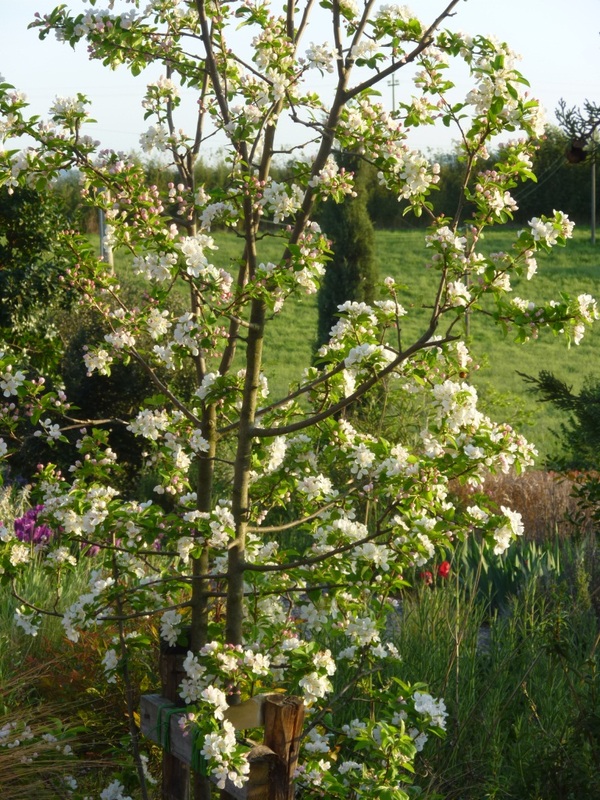 Both the crab apples are full of blossom this year, I’m pretty sure that this is due to the cold winter; apples need cold during the winter months to flower well. Last year after a wet but mild winter there were hardly any flowers and of course, very little fruit. 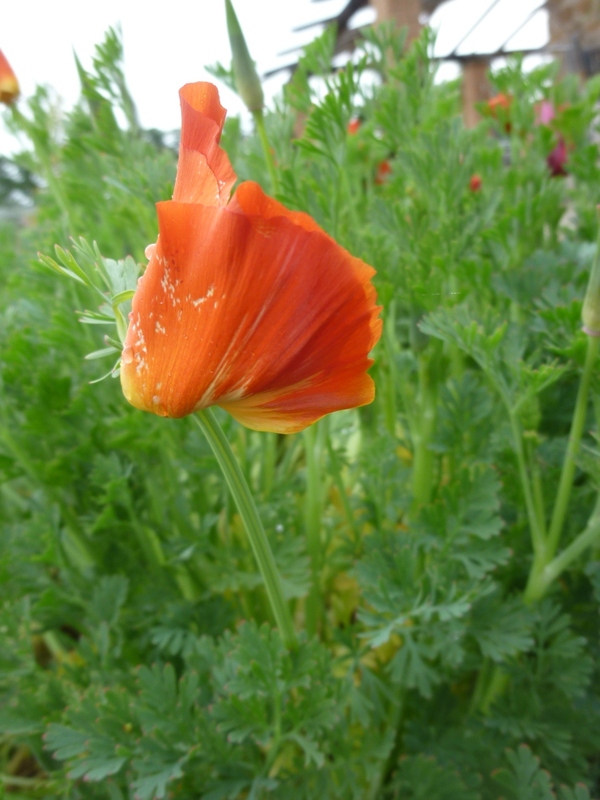 Happy accident with bright Californian poppies and scarlet tulips. 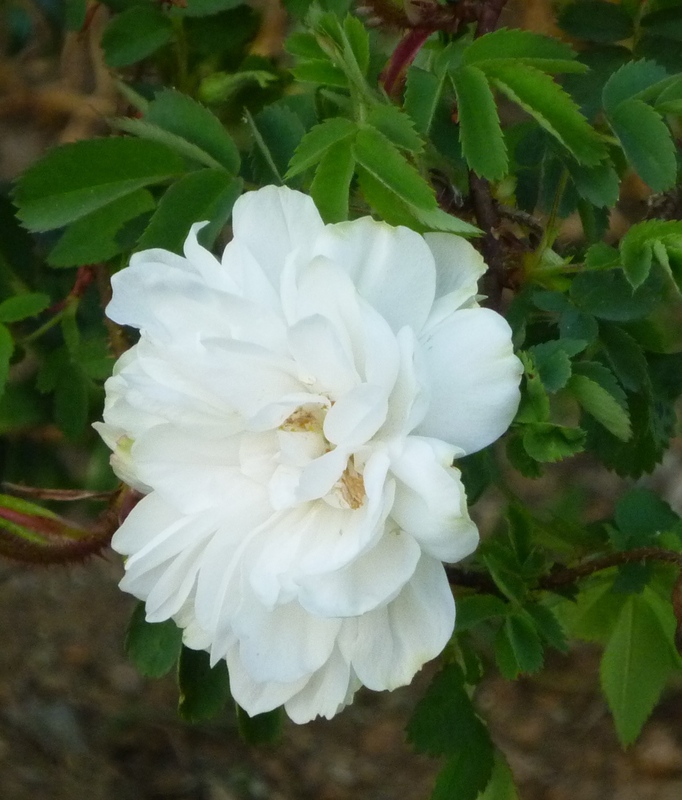 Last year the first roses were flowering at the end of March, this year despite it being so hot for much of the last month the first rose didn’t bloom until Sunday 10th April. To finish something I think will make you smile or maybe cringe! Yesterday I went to my seed and plug plant provider, more about this soon. 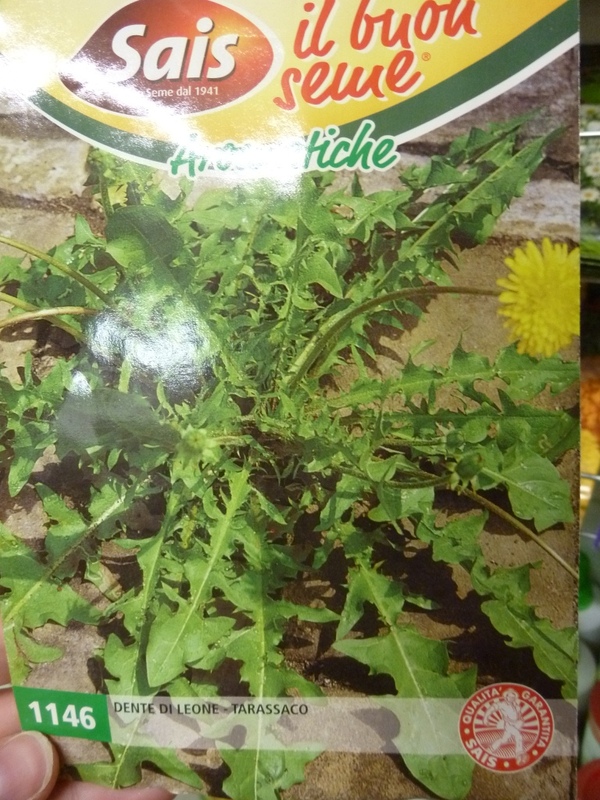 It could only happen here in Italy where the countryside is scoured for tasty leaves to add to a salad, but would you really want to BUY dandelion seeds????????????? The other day Helen the Patient Gardener wrote about realizing she had chosen a huge amount plants with white flowers; I commented that maybe she had subconsciously known that she would mainly see her garden when she arrived home from work and that white flowers add something very special to the garden as the light fails. White becomes luminous. This evening I arrived home just before that moment; but with a Campari and the new issue of my Italian gardening magazine (yes, it arrived on the 8th of the month!) 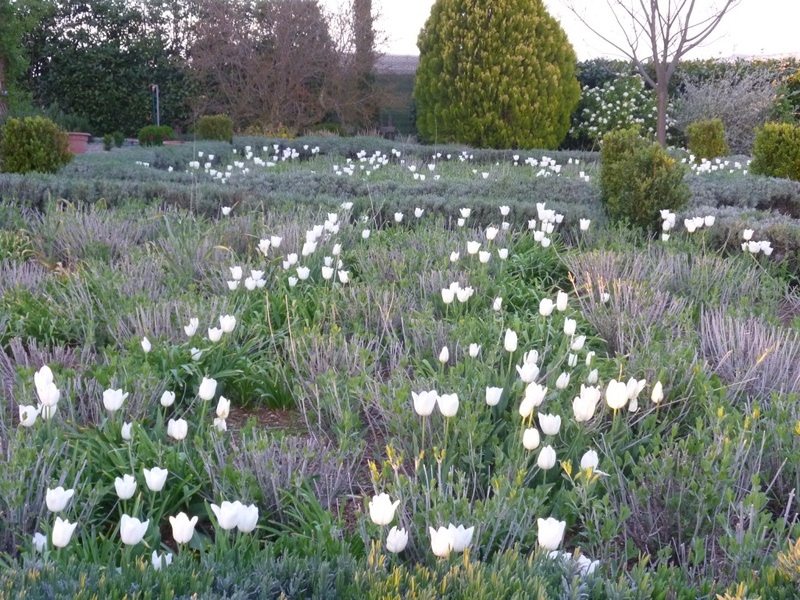 I sat enjoying the last rays of the sun and watched as most flowers lost their colour to the dusk, but White Dream Tulips in the central beds shone as if each had a light bulb inside it. Other white flowers also glowed: Choisya ternate, Convolvulus cneorum, a crab apple that didn’t flower at all last year is covered with delicate blooms that promise a good amount of fruit in the autumn (NO, I’m not wishing away spring and summer!) and in the background of one of the images I spotted the first flowers of Viburnum mariesii, that also didn’t seem to flower last year, but maybe I missed it. It has grown enormously in the 3 years since I planted. I love the form of its layered branches and the beautiful pleated leaves as they open, it was a present from my mother in law and I think of her whenever I look at this part of the garden, under the white mulberry, as she very generously bought all the plants for this difficult dry, shady situation. 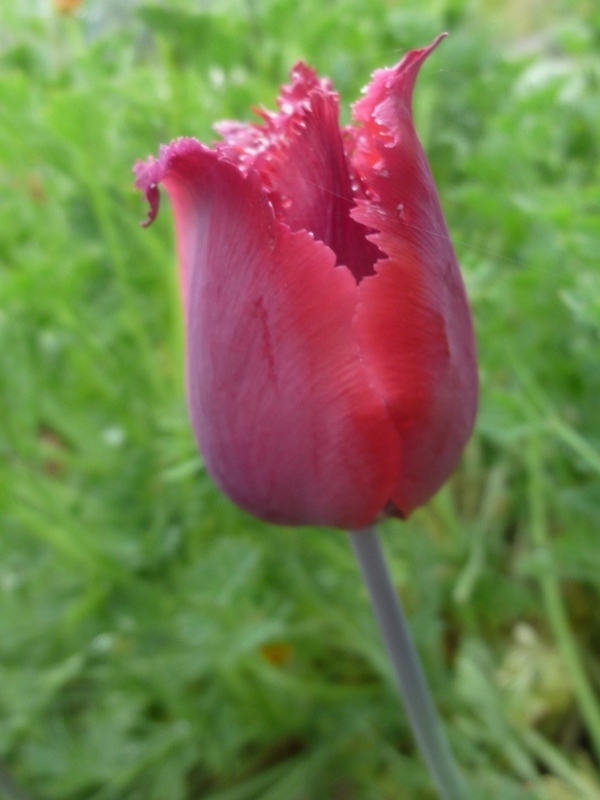 On Wordless Wednesday I posted about Tulip Brown Sugar, sadly with the very hot weather we’ve been having and the gale force winds it is already going over, but a lovely discovery is that it also dies beautifully – always an added bonus in a flower. 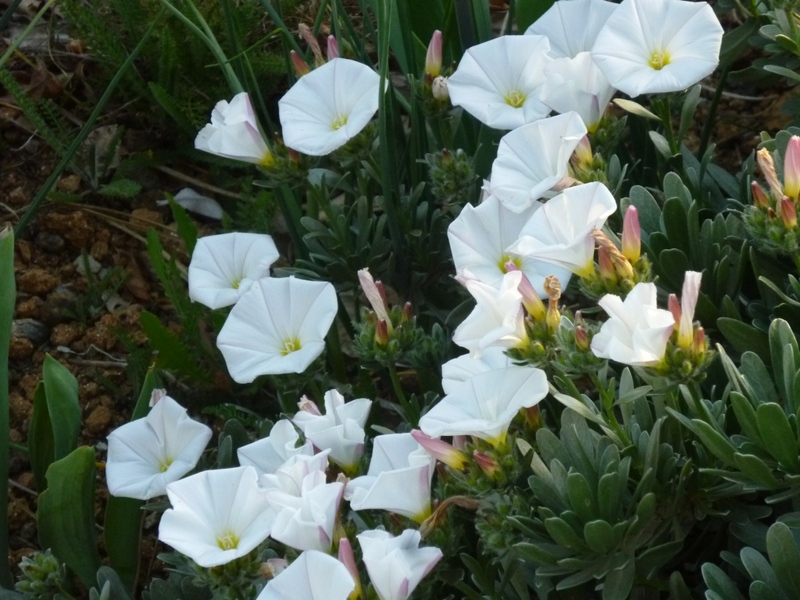 I hope you are able to enjoy your garden at dusk and I hope you have at least a few white blooms to illuminate the garden. 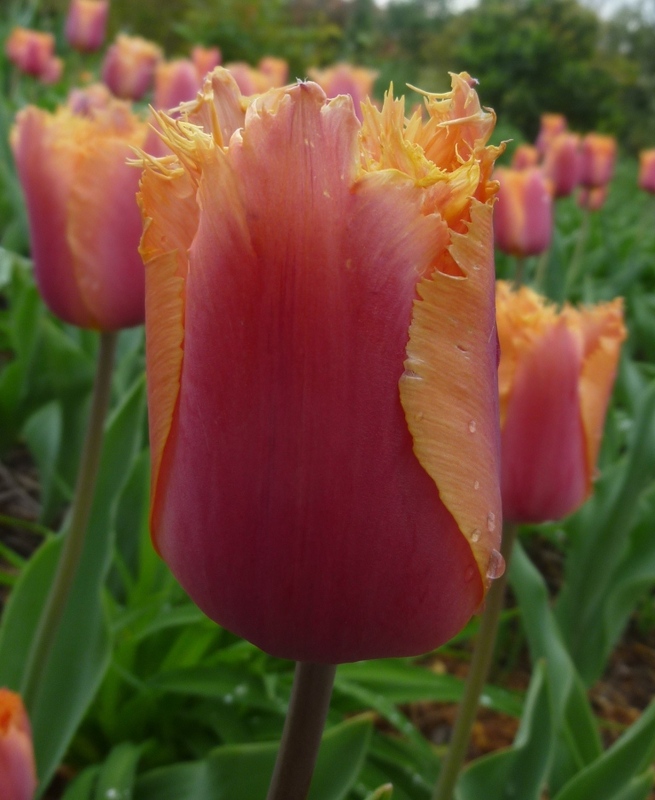 I noted when I uploaded the photos from the last two days that I had taken 92 images almost all of them TULIPS! Too many? Yes, maybe, but as the real proclaimers of spring I wait expectantly from the moment I plant them (almost form the moment I place the order) to see if they are as beautiful as I had hoped the day I walked around the garden deciding what to plant where; I should write this down as I forget when the box arrives and I waste time checking what each will look like before committing them to the ground. At least last autumn because I knew I would be writing about them for this blog I did write down where I had placed each variety. 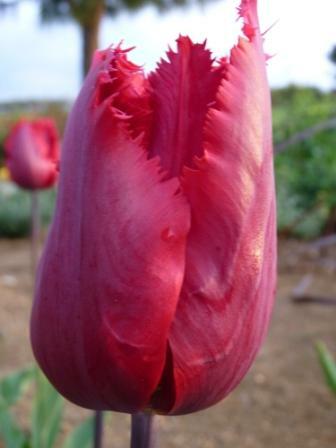 Several visitors to the garden have commented on the beauty of the frilled varieties I have. My Italian friends had never seen anything like them before, today I will share them with you. White Swan is very crisp and a pure, pure white. 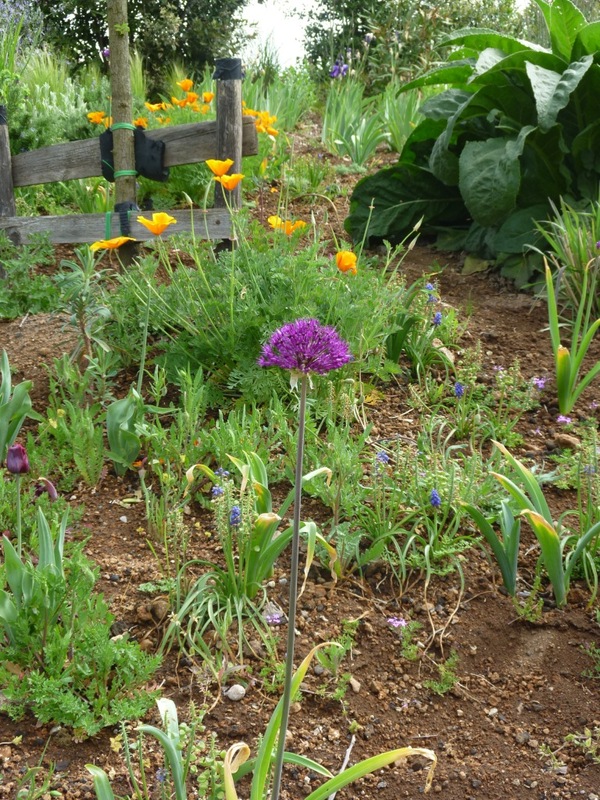 These are planted in the raised bed on the east side of the house. Blue Heron is maybe a little insipid in the strong sunshine we’ve had for the last 10 days. (It’s been so hot that the solar panel heats the water to 55° C – I have to be very careful when I turn the tap on to wash my hands). 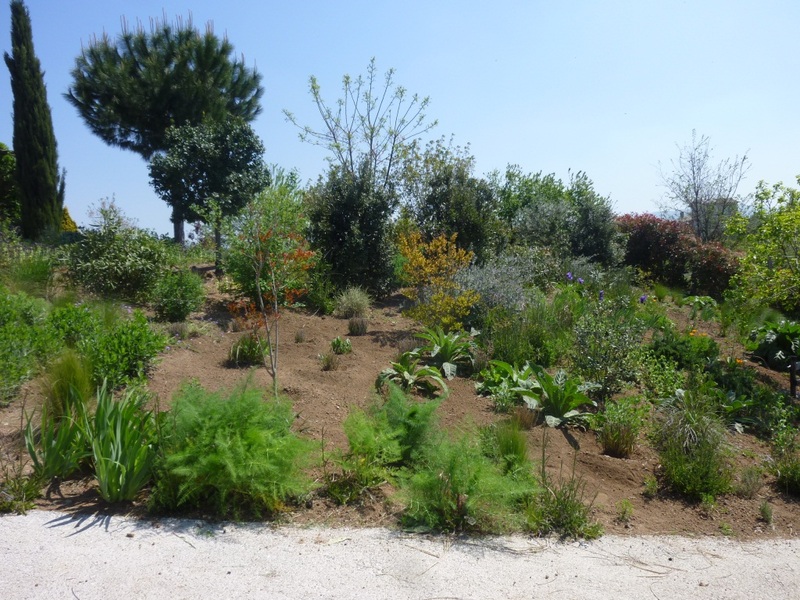 It is planted just off the path between the large island and the upper side of the slope border. Red Hat is placed on the slope, beneath the Persimmon tree amongst seedling of Euphorbia which will cover the dying foliage of the tulips later on I hope. Last year I loved Burgundy Lace for its colour and for the fact that it last for a long time and even as it died it retained its colour and so seemed to be still blooming. This year I planted more but they aren’t quite open yet and not many of last year’s have repeat flowered; this may be due to the fact that some perennials have spread to cover where they were.